The EL-W535XBSL calculator performs over 330 advanced scientific functions and utilizes WriteView Technology, 4-line display and Multi-Line Playback to make scientific equations easier for students to solve. It is ideal for students studying general math, algebra, geometry, trigonometry, statistics, biology, chemistry, and general science. 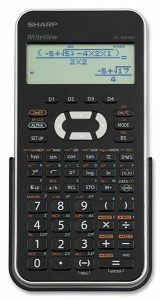 The EL-W535XBSL is a fully-functional, high quality scientific calculator that performs over 330 advanced scientific and mathematical functions. It features WriteView Technology that allows students to view formulas in the exact order they appear in their textbook. It also utilizes a large, easy to read a 4-line display and a Playback feature so you can edit formulas easily. For quick use of your desired functions, there are four programmable keys. Plus, the equation solver gives you the ability to solve three equations simultaneously! The Sharp EL-W535XBSL scientific calculator makes solving difficult scientific equations a piece of cake! Advanced technology and engineering gives you the pin-point accuracy you expect from Sharp Electronics. It is ideal for students studying general math, algebra, geometry, trigonometry, statistics, biology, chemistry, and general science. HP 10s+ Scientific Calculator, Perfect for Math / Science Classes. I bought this calculator for my stats class, and it worked out perfectly. It is not the most advanced calculator, but it is able to do many of the functions that were required. The layout of the keys make it very easy to navigate. The size and weight made it ideal for me to carry in my back pocket on the way to class. The value I got out of this calculator made my money well spent. This is a scientific calculator and I work as a Mechanical Engineer. So you'd think this would be a good fit. But this calculator only provides answers in FRACTIONS. Really? Working in the scientific world, we haven't used a fraction in 20 years. It's a digital world out there. And to be fair, there is a button that will convert the fractional answer to a usable decimal answer. But I bought this calculator to improve my efficiency....not slow me down. It's just a bad fit. I purchased it some more than one yer ago. Up to now I used the TI calculators. At the beginning it was quite hard to switch into a little bit different system, but now I love this item. It is cheap and does the perfect job in my professional activities. Really good calculator will make life easy. This product was delivered in one day I cant believe I recieved it so fast. Just in time for my Calculus exam. Thought if youre acustomed to the TI 84 it will take some yime getting used to this calculator. I have no complaints came in perfect conditon. Amazon is awesome as always. Best Scientific Calculator on the Market. This device works extremely well and has a lot of extra functions that can be used to help you on tests that your teacher doesn't notice because it's legally a scientific calculator. Kudos to Sharp. Got this for business calculus and I'm happy I did. I was a bit thrown off about how light it is, almost thought it was fake, but it's been great. If I lost it I'd buy the same one again.